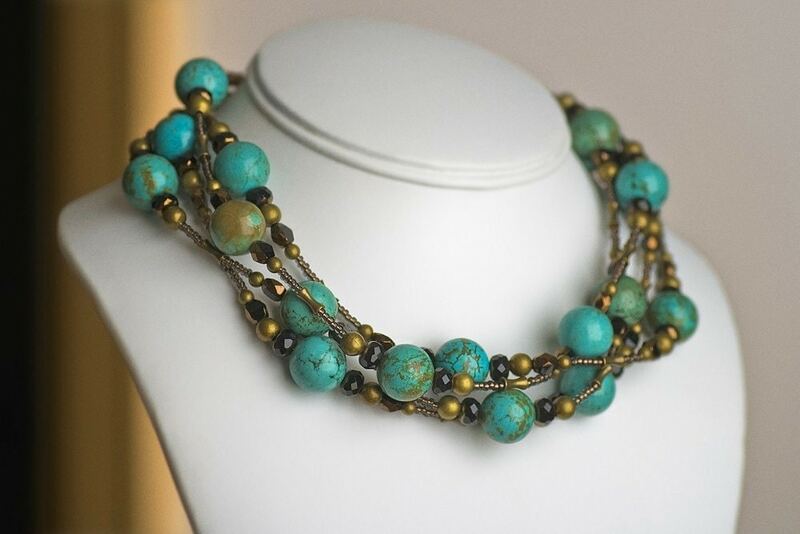 bijouxbead wearable art jewelry features one of a kind luxurious wearable art necklaces, all multi stranded, featuring glass, metal, and stones made by Canadian artist Darlene Martin. "My muse is Canada; its nature, its people, its inimitability, and the horizontal links between them. My work has a distinct aesthetic that draws from several different mediums -be it glass, metal or stone. To feel the warmth that transfers from your body to these natural elements is what first inspired me to urge people to feel what you wear, wear what you feel. As my handmade collection of necklaces, bracelets and earrings develops, so too does my passion for incorporating Canadian-ness into my work." Tell me about how you originally got into your craft, Darlene. A chance stop at a bead shop with my young daughter. I had never been in a bead shop before, and it never occurred to me we would be looking at anything other than a few plastic or wooden baubles. She enjoyed making a few things, but I think I enjoyed it a bit more. Five months later I launched Bijouxbead. It really just came out of the blue. Well, to be honest, I haven't kept any of my necklaces for myself. When I am in production mode, I almost always feel like my latest completed piece is my new favourite. If I were to receive a gift, I'd want it from another jewellery artist's shop. I have created a secret little wish list, that list is quite long! A lawyer. An Olympian. A scientist. Never in my wildest dreams did I think I've become a jewellery artist. There are so many great artists I have met through Etsy. Too many to list! I have no idea. But I am enjoying the journey. Visit bijouxbead at Etsy or at bijouxbead.com. Keep an eye out for the Bijouxbead Exhibition: Landscapes, new work celebrating Canada. March 1-31, 18 Karat Jewellers, Toronto if you're in the area.